It was a night of balance on offense for Northwestern, as the Wildcats had four players in double figures. Sophomore guard Christen Inman was the most efficient of these scorers, posting 13 points on 5-of-7 shooting. 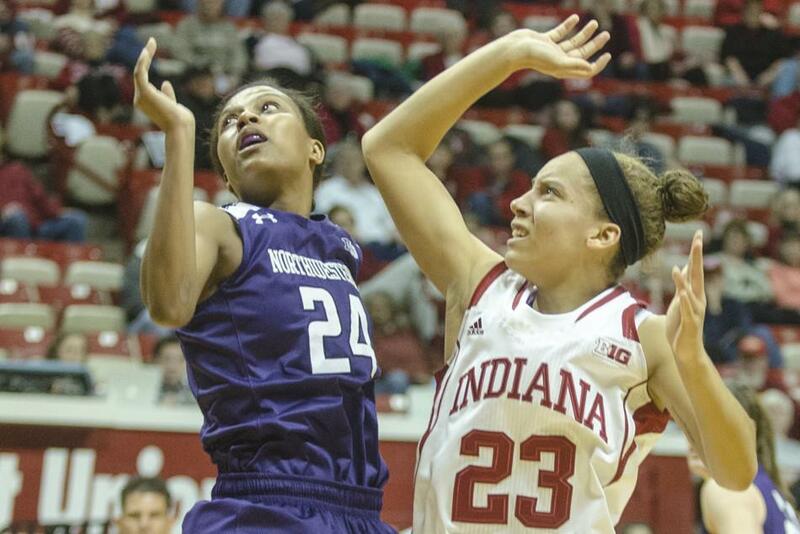 Opposing teams’ gyms continued to serve Northwestern in a friendly way on Thursday, as the Wildcats took care of business against Indiana, defeating the Hoosiers 75-69. NU (16-6, 6-5 Big Ten) had to fight hard to get out of Bloomington, Indiana, with the win and relied heavily on the little things. Indiana’s (13-9, 3-8) defense held NU to 43.9 percent shooting for the night and a mediocre 26.7 percent on 3-pointers. But the Cats were able to make up for the poor shooting with a terrific 21-of-25 performance from the free-throw line. The Cats also held their own on the glass thanks to sophomore forward Nia Coffey’s game-high 12 rebounds. Coffey also chipped in 14 points to pick up her sixth double-double in conference play. The Cats were scrappy on the scoreboard as well as in the statistics. The Hoosiers jumped out to a 10-2 lead in the opening minutes, but NU swiftly mounted a charge and methodically built to a 32-28 halftime cushion. McKeown praised the team’s hustle in the game’s aftermath and said that was a big reason his players competed so well for rebounds, even if the Cats actually trailed in that department 20-17 at the half. Hustle did play a role in the Cats dominance in early turnover margin, as the road squad forced the Hoosiers into 11 turnovers in the opening period, with NU only committing four. The Cats weren’t as dominant with ball security in the second period, but hot shooting more than made up for it. After a 35.3 percent showing from the field early (including 1-of-10 from 3-point range), NU nailed 56.5 percent of its shots in the last 20 minutes, including 3-of-5 from beyond the arc. The Cats had only 11 assists for the game, well below their Big Ten best average of 18.2 per game going into the night. Yet the offensive attack was incredibly balanced, as six players tailed at least 9 points and four were able to reach double figures. Led by junior guard Maggie Lyon, who put up 16 points in the contest, NU was able to pose a threat from every spot on the court throughout the game. The team had to deal with foul trouble late, as senior center Alex Cohen and sophomore guards Ashley Deary and Christen Inman each picked up four fouls. The Cats were in the penalty with 10:14 left in the second half. Senior guard Karly Roser and junior forward Lauren Douglas provided huge help off the bench. This victory was NU’s third on the road in conference play, and it is only the second time they won back-to-back conference games. As the team prepares for the end of the season and a possible NCAA tournament berth, it will need more performances like Thursday’s to capture the bid.